July 23, 2016, 5:45 PM · Bringing the "Milstein" Stradivarius to California has changed Jerry Kohl's life. That is what Kohl told 300 people gathered to celebrate the 300th birthday of the Golden-Period violin, made by Antonio Stradivari in 1716 in Cremona, Italy. The celebration concert, featuring Los Angeles Philharmonic Concertmaster Martin Chalifour, Los Angeles Chamber Orchestra Concertmaster Margaret Batjer and LACO conductor and pianist Jeffrey Kahane, took place at the Huntington Library and Gardens' new Rothenberg Hall. Other fine instruments in attendance included the 1711 "Kreisler" Strad that Chalifour regularly plays, and the 1650 Nicolo Amati composite, with a table by Stradivari, played by Batjer. Jerry Kohl, Margaret Batjer and Martin Chalifour. Photo by Violinist.com. "It's changed my life, because they're magical," said Kohl, who is owner and president of accessories retailer Brighton. Watching his Strad on stage is a little bit like watching one's kid in a school play, "My child's on stage!" Kohl is rooting for the fiddle to keep going another 300 years; "The people who own them care for them -- I'm just the custodian for the next 300 years," he said. And thinking about 300 years, "California isn't 300 years old -- there's not a building in Los Angeles that's 300 years old." Most of the time, the instrument sits protected in a safe, in a nice, air-conditioned room. It takes a fine artist to bring forth its finest quality: that storied Strad sound. "When I have the violin at home, it doesn't sound like this!" he said. 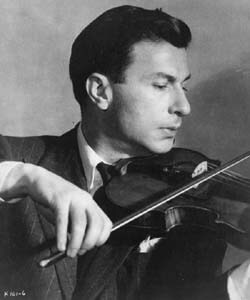 Batjer drew some beautiful tones from the violin in Gluck's "Melodie," but the moment of pure Strad-sound rapture came during the middle movement of the Bach Double, with Batjer playing the "Milstein" and Chalifour playing the "Kreisler" Strad. Bach knew what he was doing; so did Stradivari, and so did these three fine musicians. They closed the concert with the "Dance Espagnole" from "Navarra" by Sarasate -- great show-offy fun with two wonderful violinists and a great pianist. What a joy to watch them! During a break in the music, Kohl described how the idea to buy a Strad first came to him, more than 10 years ago. His daughter had suggested that he invest in precious paintings, but that didn't capture his imagination. When it came to the arts, Kohl was a lifelong guitarist whose interests lie in music. But how exactly could he make that into an investment? These were the kinds of thoughts circulating in his mind when he read an article in the Los Angeles Times that sent him down an entirely new path. The article described the journey of the "Duke of Alcantara" Stradivari violin, an instrument that enchanted its various "owners" with its sound and was at the center of something like a great custody battle, as it was lost, found and fought over in lawsuits. "I had this crazy idea of buying a Stradivarius violin," Kohl said. Kohl was fascinated with the kind of attachment people seemed to have to Strads, and to the great value attached to their mysterious qualities. He also read that Strads were being bought up by wealthy patrons in Russia and China, and he liked the idea of bringing a Strad to the United States. The first person he called was Los Angeles Philharmonic Concertmaster Martin Chalifour; then he also talked with Los Angeles Chamber Orchestra concertmaster Margaret Batjer. Little did he know the two violinists were longtime friends; they both readily agreed to help him in his search. He also enlisted the help of Google, which quickly presented him with the message: "Buyer Beware!" The Internet described violin dealers as being rather crafty. "I thought for a long time," he said, and then he called a lot of people for advice, including the head of the Smithsonian Museum in D.C, which keeps several Strads in its care. He was advised by Sotheby's that Strads rarely simply come up for sale. "The people who own them care where they go," Kohl said. Though a Strad owner won't necessarily put the instrument on the auction block, he or she might be convinced to sell the instrument to the right buyer. So Kohl found the three of most respected violin dealers in the world. (One who is now in jail!) Together, they brought him eight Stradivari violins, two from Chicago, three from London, two from Austria and one, Jack Benny's violin, from Los Angeles. 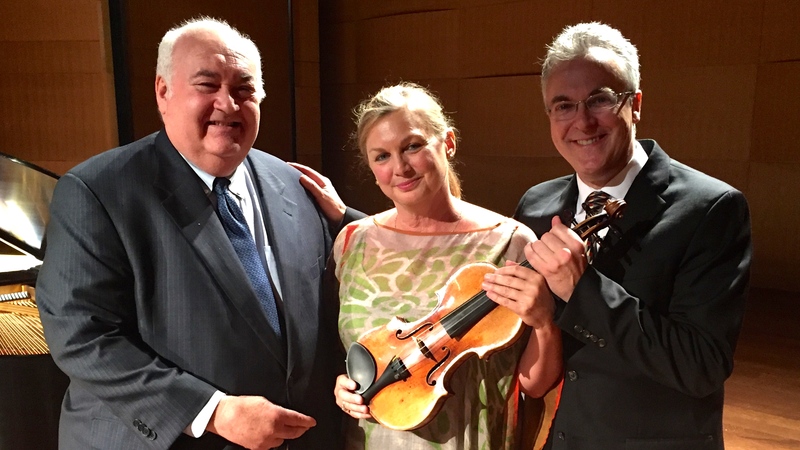 Chalifour and Batjer tested the fiddles for Kohl during a private eight-hour "violin play-off" at Walt Disney Concert Hall. The "Milstein" Strad, stood out especially to Batjer, who recognized the distinct knots on its belly and was overwhelmed with the implications: that this was the violin she'd heard in the hands of one of the top violinists of the 20th century, the Russian-born American violinist Nathan Milstein, who had died in 1992. "I knew exactly what violin it was, and I started to weep," she said. "Playing it on a regular basis -- that has been one of the greatest pleasures in my life." Not only that, but the violin was made during Stradivari's "Golden Period," considered the time of the maker's best work. 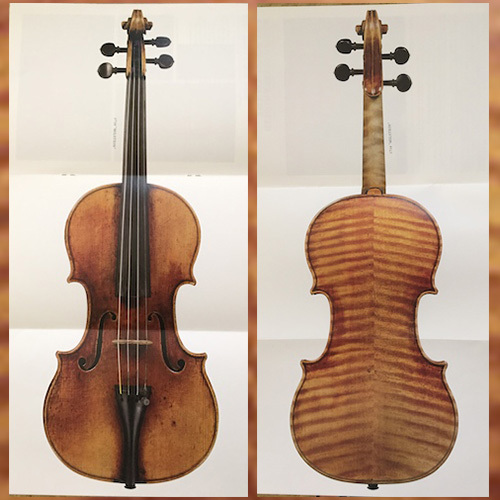 The "Milstein" Strad was actually not exactly "for sale." It had been sitting in a vault for 13 years, and the family had some specific ideas about how they wanted it used. "They weren't willing to sell it to a violinist, but they were also not willing to sell it to a museum," Kohl said. They wanted it played, but not played all the time. Kohl purchased the violin from the Milstein family, through Charles Beare of Beare's in London, for an undisclosed price. At this point, the violin is played in concert about 10 times a year. What is it like, to play on such a historically significant and valuable violin? "It's a conversation, and it's a privilege," Chalifour said. "When you learn to play the violin, you learn control over the instrument. But with a great violin, you have to make compromises and learn how to extrapolate its best qualities." July 24, 2016 at 07:56 PM · Interesting! One of my daughters (different last name) happens to work for Jerry Kohl, and the Brighton line of stores. July 25, 2016 at 05:39 PM · Yes I imagine a priceless antique violin would be quite the conversation piece and it appears that the instrument also serves as a kind of backstage pass. "You bring the nachos. I'll bring the Strad." Something like that. July 25, 2016 at 06:11 PM · It's pretty cool to have a Strad in residence nearby; it attracts fine players, historians, luthiers, listeners, and also it creates a live and local connection with the violin world, for people who might not normally think about it. Kohl has been generous in lending it out and meticulous in caring for the instrument. Certainly that beats sitting in a vault!